340-DST is rated 4.2 out of 5 by 10. 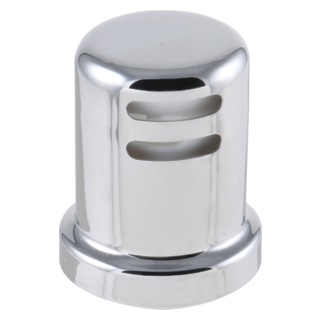 Rated 1 out of 5 by TaterTot from Faucet has come loose I installed what seems to be the same faucet a couple of years ago and remember there were little, cheap fasteners to hold the faucet to the sink. Now one of those fasteners or other part has broken and I am here looking for warranty information. Didn't last two years without mounting hardware failing. Who doesn't like crawling under the sink to replace a two year old, almost 200 dollar faucet? Rated 5 out of 5 by Bill from WJ's Delta-DST White Collins Kitchen Faucet with Side Spray Review I bought this faucet a couple months ago, (Maybe), for the sink I bought for the wife. She loves the faucet. Goes great with the sink. Rated 5 out of 5 by Chaz from Exactly what i needed Bought this a month ago "love it" i will be back to buy more!! Rated 4 out of 5 by Ann86 from One More Thing I would prefer the water flow and spray were integrated instead of having the spray a separate item, but the plumber chose it so it is OK. Rated 5 out of 5 by BillieReaney from Excellent choice Beautiful, yet sturdily functional and easily installed. A good choice for the money. I recommend it. Rated 3 out of 5 by wildone from Not too bad Great finish, very easy to install. The only negative I have is that the water flow is not very strong. 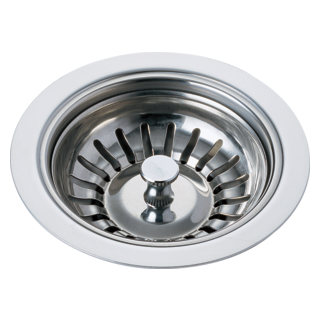 The flow on my previous faucet when turned on full would literally come out so hard that it would splash out of the sink, so I had great water pressure and I was looking for some water flow reduction. However after installing this faucet, the water flow was extremely reduced to the point where it takes forever to rinse dishes. It has a sprayer that when the water is on full, I could shoot water into the dining room! So now, to use the sprayer I have to shut the water down by half or I will be soaked. Stop using the sprayer, and now I have to hit it on full blast again. No middle ground. 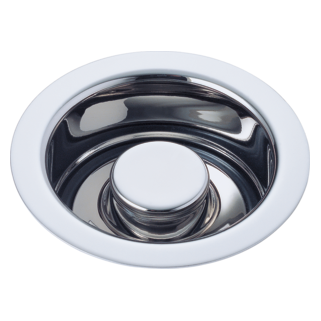 Great product but water flow out of the main faucet is restricted way too far and the sprayer is not restriced enough. What is the difference between the DST 300 and DST 340? 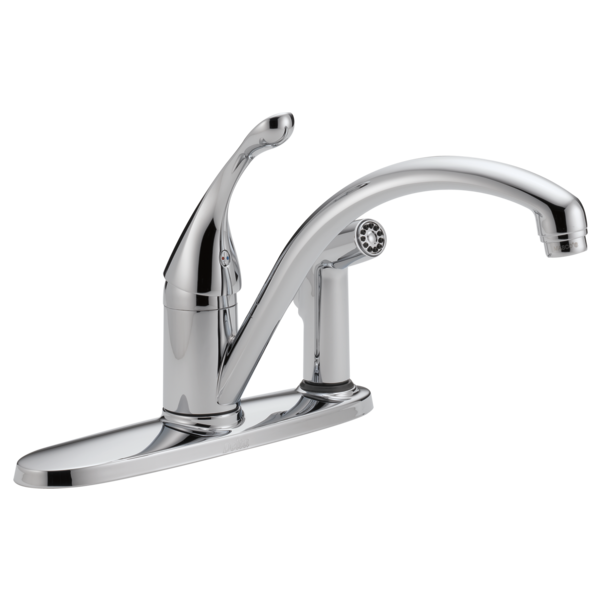 I was looking at both the DST 300 and DST 340 and was wondering what the difference in the kitchen faucet is? Is there a weight available to improve sprayer hose retraction? Do both left and right sides use same threaded mounting tubes? Or does the left mount, the one without the sprayer, use a solid bolt? I ask because I've installed water filter spigots through the left most sink hole before, but a number of faucets appears to have a bolt that goes through the left-most hole rather than a threaded tube (similar to the threaded tube for a sprayer or 2 handled faucet). How long is the spout? and Is a longer than normal spout available? Thank you for your question. 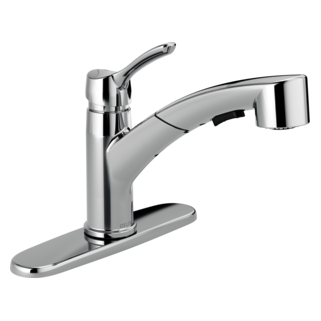 Delta Faucet model # 340-DST has a spout that is 9 3/16 inches. There is not a longer spout available for this model. Differences between 300-DST and 340-DST? Is body of the Collins 340-WH-DST plastic or metal? 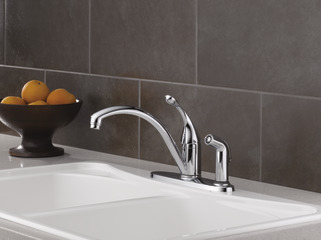 I have a current Delta kitchen faucet that I am replacing. 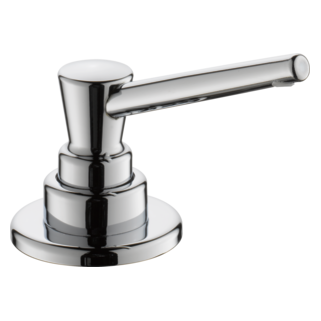 I want to replace it with another faucet that is also of metal construction. Are the parts and body of the Collins 340-WH-DST mainly made of metal or plastic? Thanks. Thank you for your question. Delta Faucet model # 340-WH-DST is composed of metallic and non-metallic components.